All this, plus 50 billion euro worth of Greek assets to be taken out of Greece and placed in a Euro body which will be sold to pay back debt. 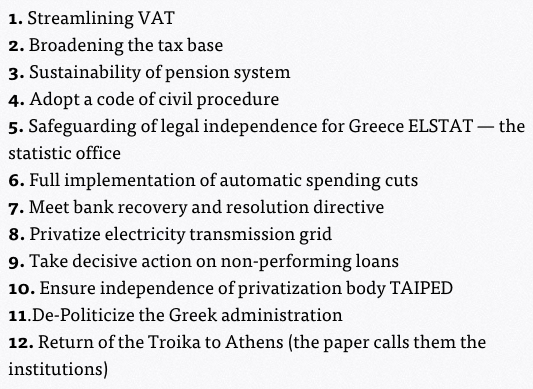 And all of this has to be okayed by the Greek Parliament and the Greek government by wednesday. If not this, then they suggest a “temporary” Grexit, for five years, after which Greece may be asked to return to the Euro. The last point is evident: if banks are closed for two weeks, there is now little time left. Greece is going to have to make a tough decision soon. The establishment have played this very well, if the plan is to anyhow exit the Euro. This deal makes it sound like they were forced out even when they were willing to bend over backwards. But if that’s the option, they have to take it now, or home resentment for their stand will go against them. There is no “temporary” Grexit. There is either a permanent exit and debt default, or Greece is in the Euro. The former is particularly likely, unless everyone calms down and is okay with kicking the can down the road again. Watch this week. Volatility will be back, in a very big way!